I really love the sewing supports! I'm such a book geek. Linda sells her books on Etsy at UniquelyCovered.Etsy.com. 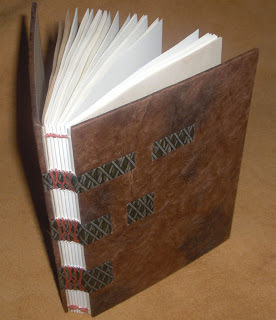 She has quite a range of blank books, some with the exposed spine like this, and also case bound, and she also uses wood and metal and leather as well. She also has some cool jewelry, or wearable art she calls it. Thanks so much Linda! This is stunning, what a wonderful swap. Thank you for your kind words. I'm glad you are pleased with this journal. I too, am a book collector, and can't wait to see what new book I get to add to my collection.